This was once the location of Cross Roads Baptist Church of Christ. In 1902 the church building was moved to Celina and the name was changed to First Baptist Church of Celina. 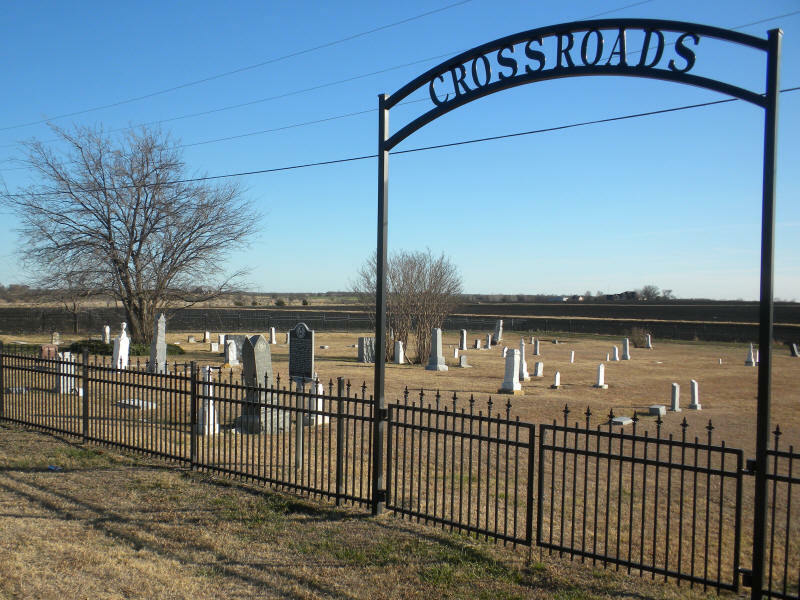 According to REMINISCENCES OF CELINA, the Cross Roads Baptist Church was north of the cemetery in 1882 on land jointly owned by A. D. Stelzer and Edmond Stelzer, who were sons of Christian Stelzer. A. D. Stelzer gave his half of the proerty to the church and Edmond Stelzer was paid $12.50 for his half. The deed for the cemetery, listed in Vol 277, p 547, mentions that it is east of the Ed Stelzer survey. The cemetery was sold to the Cross Roads Cemetery Association in 1930. The cemetery covers about 1 ½ acres of land. It is surrounded by a wire fence and has a double gate on the north side. It shows a good bit of vandalism. The grass is cut about once a year. The fencing needs some attention. 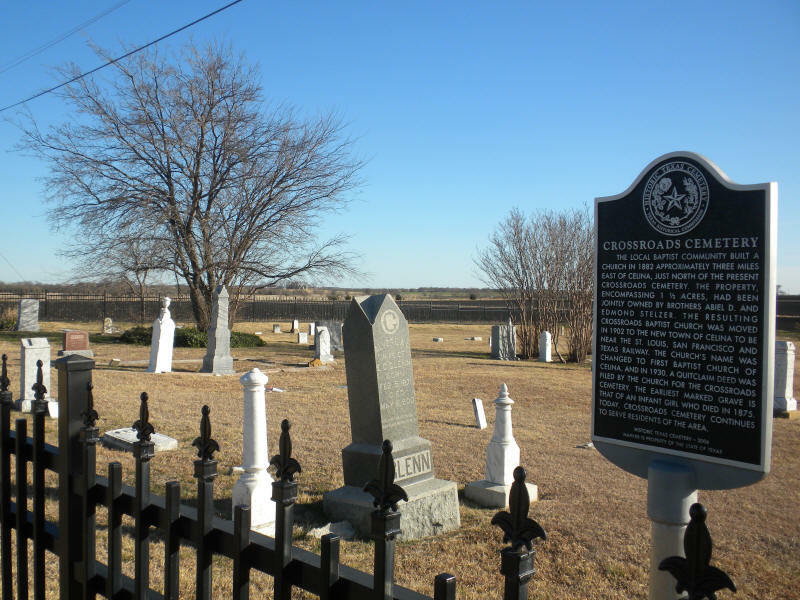 First Baptist Church of Celina filed a quit claim deed in 1930 for the cemetery. They have had the Sheriff's Department clean the cemetery in the past. At the time, the prisoners had trouble with bees chasing them. I have heard of a recent burial in the cemetery, although I do not believe that the cemetery is supposed to be active. There is a story that in 1862 Christian Stelzer was the last person to be scalped by the Indians in this county. The story is repeated in Elder Horn's book and in several others. According to REMINISCENCES OF CELINA, Christian Stelzer and his son Abiel were building a fence when two men on horseback went by. The men made fun of the fence and Abiel threw a rock at them. In the ensuing argument, Christian Stelzer was stabbed several times in the stomach. Abiel managed to get him back to the house where he died. He was buried where he was wounded, under a tree, which was ½ mile south of the Cross Roads Cemetery. Because of the unsettled times around the Civil War, the murderers were never caught. The book also says that only his stone was moved to the Old Union Cemetery in Celina, which is about 1 mile due west. COLLIN COUNTY CEMETERY INSCRIPTIONS II lists Christian Stelzer's grave as the Stelzer Family Cemetery. I have heard of another Stelzer Family Cemetery. It supposedly contains the grave of Abiel Stelzer. Abiel D. and three other Stelzers are buried here in the Cross Roads Cemetery. I believe that the Cross Roads Cemetery and the Stelzer Family Cemetery are the same ones. Edmond Stelzer, his brother, and Christian, his father, are in Old Union Cemetery.